As the summer holidays starts from April, the Sri Guru Raya School of Yoga announces a Yoga adventure for your kids. A yoga camp for the young ones, to help them improve their health and maintain their energy levels. Learning yoga at an early age helps children maintain their body flexibility and utilize their energy for the right purposes. It helps them to focus on their curriculum and also provides stamina for their extracurricular activities. 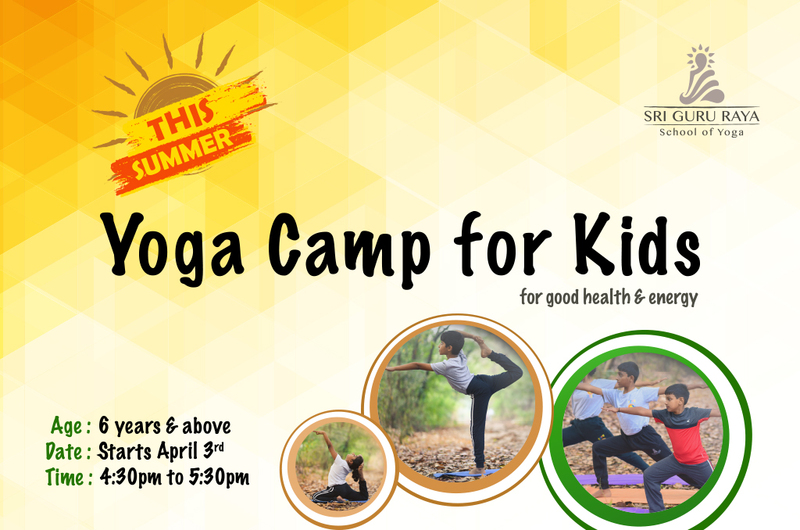 Register your kids for a Yoga summer camp, this April – May @ Sri Guru Raya School of Yoga. The origins of Yoga have been speculated to date back to pre-Vedic Indian traditions, but most likely developed around the sixth and fifth centuries BCE, in ancient India’s ascetic circles, which are also credited with the early sramana movements. The chronology of earliest texts describing yoga-practices is unclear, varyingly credited to Hindu Upanishads and Buddhist Pāli Canon, probably of third century BCE or later. The Yoga Sutras of Patanjali from the first half of 1st millennium CE is one of the key surviving major texts on Yoga. Hatha yoga texts emerged around 11th century CE, and in its origins was related to Tantrism.